What’s the first thing that you look at when you check your Instagram account? If you’re anything like me―a digital content sponge, you thought of the Instagram Stories of course. That’s the stream of short content stories on top of the main Instagram feed usually from some of your favorite Influencers. Here users can post photos or short video clips that will end up vanishing after only 24 hours; but it’s a great way to share quick pieces of information and content such as: announcements, event previews, behind the scenes video, product discounts, or even just interesting facts about yourself (i.e. your brand). 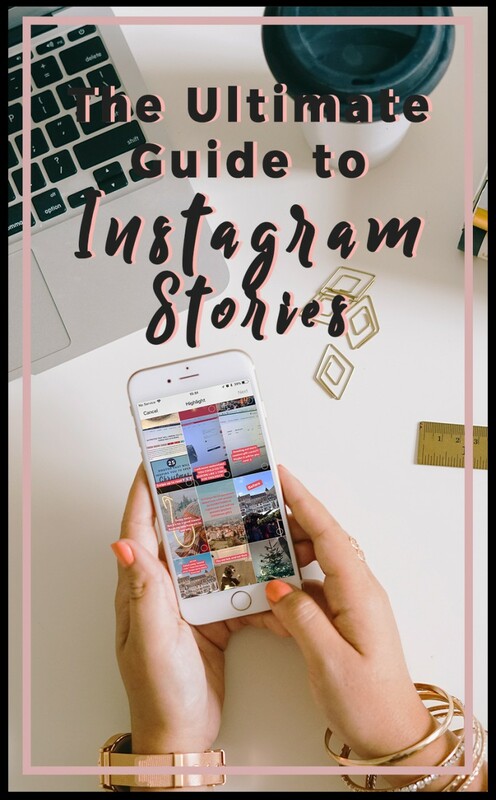 From a business perspective using these Instagram stories should be part of your overall Instagram marketing strategy. Why? Well, for starters there are a staggering number of users each day on Instagram. Imagine all of the opportunities to promote your business that Instagram stories provides. In short, it’s a unique marketing chance for any business looking to build its brand and expand its reach. An Instagram Stories takeover is an interesting and creative method to mix into your social media marketing plan. Partnering with an Instagram influencer, or even a celebrity, is a terrific way to expand your influence, grow your tribe and reach untapped market segments. Think of it as putting your business on a billboard alongside a busy major highway. Your brand will be on display for all to notice. It’s the same affect when you align your brand with an Instagram influencer and host a Stories takeover event. There is marketing power in numbers; by implementing a Stories takeover your brand will undoubtedly reach a larger audience. I know what you’re thinking. Just what exactly is an Instagram Stories takeover and why should I let someone take over my Stories feature? Just as the name implies, it involves another Instagram user basically “taking over your account” for a brief time period, normally 24 hours, with the purpose of engaging your followers and expanding your audience. The takeover only applies to your Instagram Stories feed; this is different from a regular Instagram takeover where another user takes control of your entire profile. The person you collaborate with will create their own stories and post them to your Instagram account so that your followers can see them. The takeover event can be the ultimate win-win situation. Your chosen partner (aka rock-star influencer) will bring value to your followers while the guest is able to reach a new audience with their content. This can lead to skyrocketing numbers for your followers count, growth for your brand and additional sales profits for your bottom line. By design these Instagram Stories are time-sensitive so hosting a takeover event is serious business. The clock is ticking because any Stories on Instagram fade away 24 hours after they’ve been posted. That’s right, your followers have just one day to see the Stories. You need to set up a game plan ahead of the event and you also want to make sure that your followers tune in on the day of the event. So, promote the takeover event across all your social media platforms not just on Instagram. Furthermore, you want to see measurable results from these takeovers so be creative in your delivery. They should also be interesting, informative, and fun for the audience. Once all the planning is done you can sit back and enjoy the ‘show’ for the next 24 hours as your chosen influencer steers the creativity. There are many ways to get creative with the Stories feature. On event day your guest could post short videos from an interesting location, or introduce your product or service in an eye catching way, or perhaps host a question/answer session with your followers. They might also announce an upcoming special event or a contest. Or, they could do a series of short videos where they give followers a glimpse into the everyday life of your business―a behind the scenes look of your brand. Thinking of hosting an Instagram Stories takeover? Smart move. Making use of this marketing strategy is an excellent way to expand your reach and these can be hugely successful when done correctly. To ensure success use the following helpful tips to get the most out of this creative marketing opportunity. Start your marketing engines. As with any of your marketing campaigns you should make a plan and set your goals first. What do you want to achieve from the takeover event? Be precise. The more clearly you define your desired end result the better game plan you can develop to make that happen. For example, do you want to gain new followers? Are you introducing a new product and you need some star power promotion? Do you want to give folks an inside look at how your business operates? Increase brand awareness? Are you looking to get on the radar of new audiences? Designed a chic new workout tee and you need a fitness influencer? Yep, you decide. So be sure to set clear attainable goals. Set a clear target (or several of them) that you want to reach by hosting the event. With an emphasis on creative and entertaining Stories be sure this aligns with the goals you set for the takeover event. Define what a success would be for your brand as a result of the takeover and strive to attain it. Though there is no set in stone figure for how much a Stories takeover will cost, in all likelihood you will be paying a few thousand dollars. Does your budget allow for that number? After you have set your desired goals, you then want to determine your budget. Consider the cost of the event as an opportunity investment in your brand. What are the benefits from hosting the takeover? Your answers to that question will largely influence what your budget will be. The person that you choose to host your event will also influence your budget. Their time, efforts, and creativity all come with a price tag. Remember, these events are exciting and fun but your guest is not adding their star power free of charge. Instagram Influencers can charge from a few hundred dollars to several thousands of dollars depending upon content creation and the overall quality of their followers. That old saying is very true―you get what you pay for. Be sure to also add in costs for any transportation or lodging needs if your guest is at a specific location. Need a video shoot from Venice Beach to promote your updated line of surfboards? Well then that’s going to cost a few dollars for sure. In short, weigh the benefits (of the event), then run your numbers and you will get an approximate total cost for your Stories takeover. Decide on a guest host for your Stories takeover. This is a critical choice. Will your followers respond well to this person? Does this person’s personality enhance your brand image? Are they in line with your company core values? You can be sure that your followers will notice if they are not. Is your guest popular with audiences that you want to reach? Are they easy to communicate with or must you go through their gatekeepers? All pertinent questions that need to be addressed before you can select the right partner for your brand. Additionally, you need to keep your goals and your budget in mind as you make a decision. Are your goals over the top and set quite high? That’s fine but there is a higher cost to partner with a mega popular influencer. Perhaps your brand would benefit just fine from aligning with a smaller micro-influencer. Again, what results do you want to achieve from the takeover. Whether you want your message to reach potentially 100,000 followers or simply a few thousand followers, the fees you pay will reflect that. Bottom line: Choose a partner that will provide results that benefit your brand while staying within your allocated marketing budget. Goals―check. Budget―solid. Influencer―set. Great, now you need a ‘meeting of the minds’ with your takeover partner. Start planning the event. You should work together to develop a strategy for your Stories takeover. Start by sharing your goals, expectations, and desired results with your partner. Have a brainstorming session to make sure you are both on the same creative page as far as the takeover event is concerned. Be organized and plan ahead. How many Stories will be released during the takeover? Is there a preferred time schedule to release them? Depending on locations, what times would allow for peak engagement? Discuss different ways to increase the entertainment value of the Stories as well. And, lastly, make sure to leave your influencer partner with plenty of freedom to express themselves in a creative way. If you hired an online media ‘diva’ as your takeover guest host then simply set the guidelines, take a step back and enjoy the show along with the rest of your followers. Once your planning is complete you need to then focus on promoting your takeover event. After all, you want to make sure that folks will show up for the event. This is a big deal for you and your brand. What you want to do is post the event within your Instagram feed as well as announcing it through your Instagram Stories feature. This way even those followers who don’t necessarily follow Stories can be sure and tune in. Your guest host should also do the same for their followers. Remember that the Stories have a very short shelf life so promoting the event within your main feed is a must. Build excitement maybe even offer an incentive or a giveaway of some kind to get folks to show up for the event. Now is the time to cash in on your creative marketing skills. Not to be overlooked, you should both also promote your Stories takeover across all your social media accounts. That’s right Facebook and Twitter followers you’re invited to this takeover event too. Introduce your other social media followers to all the terrific content they have been missing out on by not following you on Instagram. Include a brief preview of what will be taking place during the Stories takeover and obviously mention your guest influencer to further build up the anticipation. If everything goes according to plan you will have plenty of eyes on your Stories takeover and, if they are entertained by your original content, a ton of new Instagram followers. Followers that will soon turn into loyal customers. One of the best ways to measure the success of a Stories takeover is to compare the changes in the metrics. For instance: How many followers did you gain during the takeover? In the days after the takeover? How much engagement did you receive during the 24 hour Stories period? Compare the numbers. Are they on par with your goals and guidelines? What did you learn? Is there something you would do differently the next time? All things considered, when you compare the pre and post takeover numbers was your event a success? Is your brand better off as a result of the time, resources and money invested in hosting a Stories takeover? In other words, take the time to review and learn from the results of your event. Hosting an Instagram Stories takeover is definitely a unique marketing opportunity. This fosters creative fun engagement for your existing followers and introduces your brand to an entirely new audience. Select the right partner, plan accordingly, stick to your budget, and effectively promote the event and you just might see more and more followers turning into loyal customers. Building a solid brand one follower at a time. How you choose to reach them is up to you. Make Instagram Stories takeovers part of your overall social media marketing strategy. That’s a winner. Find your tribe, my friend, and tell a story. For many years Sears―the once popular retail giant a time, would mail thousands of product catalogs to potential customers. In October of 2018 Sears filed for bankruptcy. Many factors, of course, contributed to the downfall of this once mighty retailer but if your business still relies on expensive traditional marketing methods―print, radio and television then there is one question that needs to be asked. Why? There is a digital revolution taking place and it’s called social media. However, unlike traditional media this social media is built upon an abundance of interactions with users. What makes Instagram an absolute spot-on place for a business to build its brand and grow its online community? Well, for one thing it is insanely popular; Instagram has over 300 million daily active users. That fact alone makes it any marketer’s dream. Instagram is also a visual-centric platform. If a single picture is worth one thousand words what is a content stream with multiple formats packed with vivid imagery worth? In the same way that Google ad words changed the playing field for online search results Instagram is proving to be a game changer as well. What’s the secret to success using Instagram for your business? Success leaves a trail to follow. No matter what your product or service is be sure to present it in way to attract attention. Instagram includes filters so it’s easy for almost anyone to make their photos worthy of sharing these days but especially so for a business to focus on visually presenting your brand in the best light. Glossier is perhaps the crown jewel of an Instagram-first strategy success story. The insanely popular makeup and skincare line started by a beauty blogger is essentially an online experience. There is no fancy downtown main street retail store so they rely on social media. True, these products are highly photogenic but moreover Glossier has built a very stimulating visual brand. The brand’s pink-ness practically jumps off the screen. It pops. It catches your attention. Another example, is the online publication Punch Drink. They provide cocktail recipes, and various city guides on its site and although that could be rather vanilla in terms of imagery they use creativity and high quality photos to appeal to a niche audience. A different drink appears in each image presented in a way that almost lets the viewer taste it with their eyes. The message here is to be creative with your images. It’s not just about selling a product, it’s about capturing a feeling and expressing this through visual imagery. Keep in mind that if your business is not an actual bricks-and-mortar store, it’s even more important for your social media presence (Instagram) to set your tone for your brand. Once set, stick to it. Use the same color themes, formats and also try to maintain consistency with how often you post. In other words, you want to maintain the business cohesiveness throughout the user experience. Strive to create a visual impact and build your brand so to attract thousands of loyal followers. 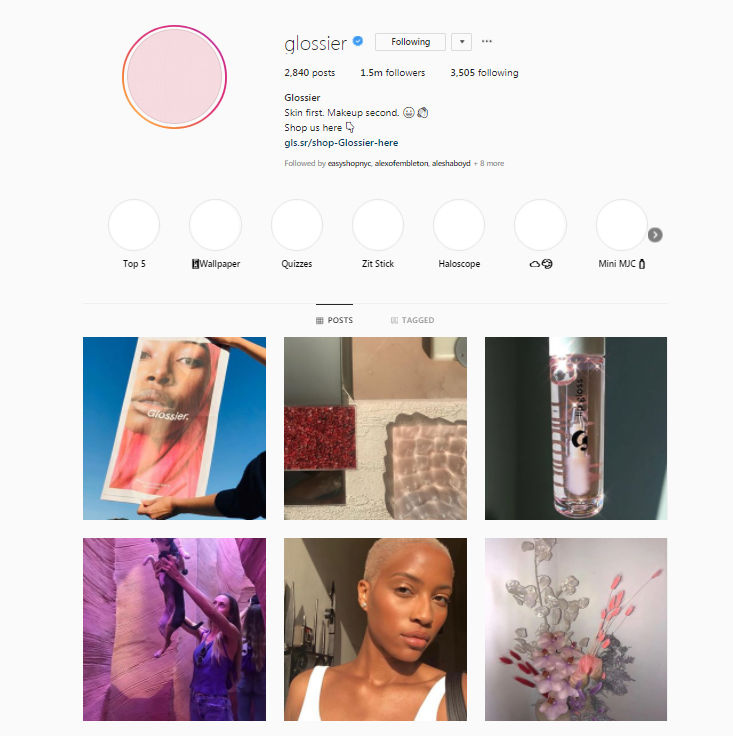 If you were to visit Glossier’s Instagram page one of the first things you might notice, besides the abundance of their favorite pink color theme, is that many posts within their feed show happy customers using their products. Selfies galore. They put the spotlight on their customers. A highly photogenic product for sure but the attention they give their customers creates an experience. Basically, that beautiful results can be achieved by anyone. They truly feel like they are part of a special tribe. The ‘IN’ crowd. Tap into your customers’ desires and needs with your Instagram content. 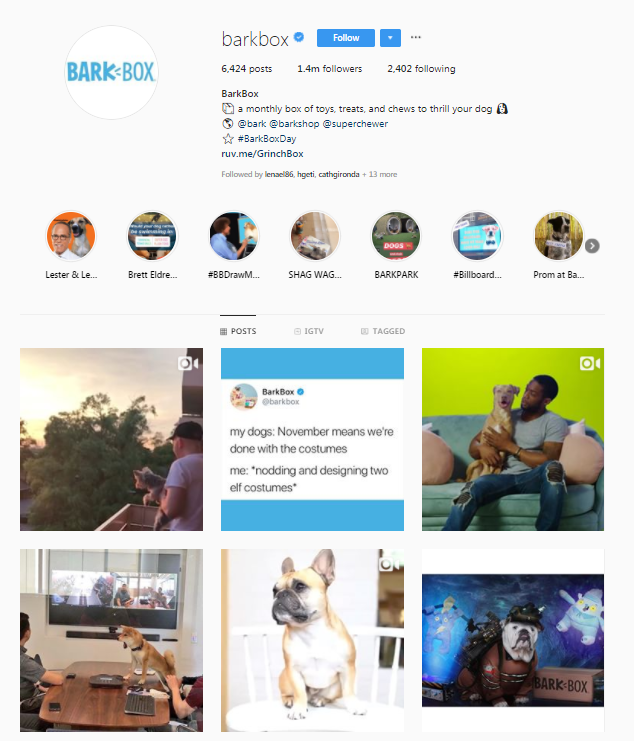 Consider the BarkBox brand with over 1 million followers. This company provides products that keep pooches happy. Their visual stream is full of funny dog content and they provide discounts and more to followers. We all know how much folks adore their pets. The entertaining visual content grabs your attention. The sweet deals and discounts keep you there as a loyal follower. It’s the perfect blend of engagement. Entertain your audience, give them what they want, and they will keep coming back for more. The Instagram marketing employed by the BarkBox company proves that they understand their customer’s needs. As yet another example of placing your customers in the spotlight look at Adobe on Instagram. Almost all of the posts you will find are user generated content. It’s the “see what I can do with these products and then share it” strategy that works for them. Their stream of content is basically a canvas for all their designer type followers to showcase their work. Over 800,000 followers and counting. Ideally you want your audience to think of your account (i.e. your business) as one of their favorites on Instagram. So how does your business stand out in a vast digital empire of visual stimulation. Think about how your products or services can be used within Instagram content. Not everyone will have photogenic products but there are many ways to feature even the most routine products in creative ways. Sometimes you just have to think a little bigger. Ask yourself―can your customers share your product or service? What would make them want to share it on their own feeds? What creative ways can you think of to engage your followers and encourage sharing? To put it another way, people will share what they love and feel great about doing it. That experience is the power and influence of social media. Consider what is currently trending. What is the popular movement right now? Can your business tap into this and use it as an advantage? Perhaps. Health, fitness and lifestyle trends are always hot topics within social media. La Croix, the flavored sparkling water company capitalized on somewhat of a social media ‘perfect storm.’ Healthier lifestyles and Instagram’s popularity are both on the rise. La Croix benefits from both of those facts. For instance, they engage with fans and encourage them to use hashtags to share La Croix experiences and photos. They also work with many ‘micro-influencers’ to help spread the word about the sweetener-free alternative beverage. Trending now? Fitness enthusiasts and nutrition influencers are happy to share La Croix products in their Instagram posts. Though they have been around for years their resent resurgence is in large part due to their focus on digital marketing efforts rather than traditional methods. Another example of this ‘marketing a lifestyle’ trend is Bitwell Inc., the motorcycle helmet and accessory company. Sure they sell the products but what you see on their Instagram feed is the lifestyle that comes along with it. Where can you go on your ride? Scenic landscapes. Adventure. Freedom. Powerful images all courtesy of user generated content. Instagram makes it easy to grow your business. Find and connect with your tribe. Share your lifestyle. What does it take to grow a business from literally zero to 50,000 raving fans known as followers? Growing your business organically on Instagram is fine but sometimes you need a little kick―a jumpstart. Through the use of technology your business gets immediate results. You get valuable feedback, you really get to know your customer, likes and preferences, and this information makes it easy to suggest what they might purchase in the near future. With Instagram ads you can really focus in on your target customer and make sure that you’re getting the most out of every post. 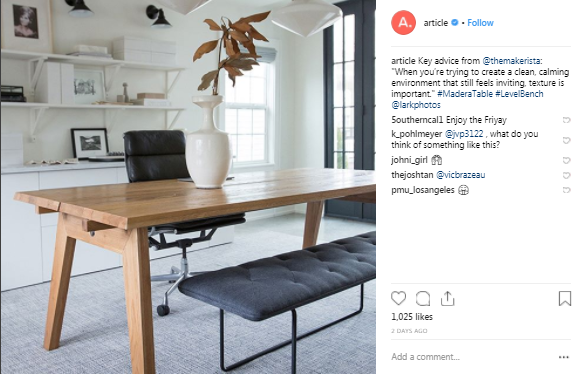 Article, a chic interior designs company, is a great example of the use of Instagram ads. In 2016, they developed an ad campaign featuring interiors styled with Article’s sleek furniture. For the audience this created a desirable experience. They see it, they want it, they buy it. Done deal. Article is also another company that is entirely online so their social media presence is crucial. Social media is becoming more and more relevant in influencing buying decisions. As a business you need to make it easy for your customers purchase your product through Instagram. And, without an actual storefront, as is the case with Article and Glossier, your Instagram ‘store’ and content needs to be easy to navigate. Therefore, including shoppable posts to allow followers to purchase a featured product directly from the Instagram content is a great idea. Results? 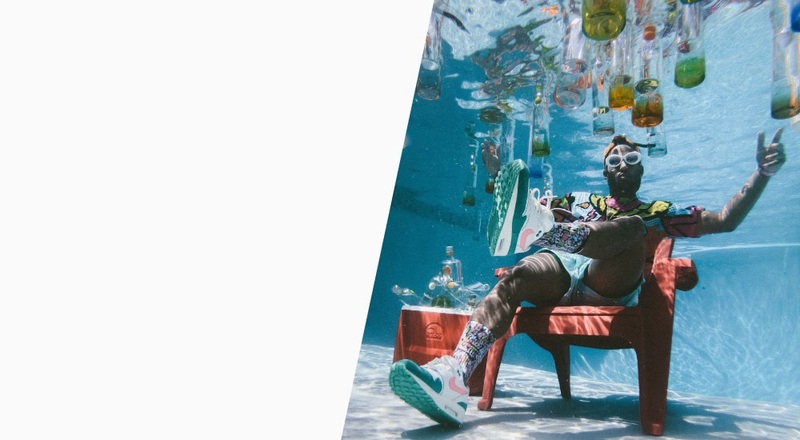 Thanks to their focused ad campaign, Article saw a huge return on their marketing dollars and that over 35% percent of sales included Instagram in the customer buying process. Using technological tools available through Instagram can be a tremendous way to focus in on your target customers and pump up your sales revenue. Throughout this article we have seen examples of successful brands that tend to use an Instagram-first marketing strategy. Blend in our four key elements and you can see that when compared to traditional marketing methods this is really a better use of your creativity and of the marketing budget. For smaller businesses that are just starting out every penny counts. If your business is not incorporating an Instagram marketing strategy you may be missing out on a ton of opportunities. At its core, the Instagram platform is visual driven social media. Perfect for your business. Companies such as Glossier, Barkbox, and Article have impressive proven success stories. Success leaves a trail. Who will be next? Maybe your business? Hashtag #success.